Enjoying a sell-out run when first presented in the Linbury Studio Theatre at the Royal Opera House, this operatic refashioning of Oscar Wilde’s most famous play is wildly inventive, exuberant and anarchic. Jack and his friend Algernon are in a pickle: they love Gwendolen and Cecily, but there is confusion over who is called Earnest – a name of which both girls are very fond. Gwendolen’s mother and Algernon’s aunt Lady Bracknell strongly disapprove. Gerald Barry’s adaptation was first performed in a concert version, soon recognised as ‘a genuine contemporary classic’ (New Statesman) and given a Royal Philharmonic Society Award. Since fully staged by Ramin Gray for the Royal Opera House in a modern-dress production giddy with cucumber sandwiches, smashed plates and megaphones, the high-octane comedy returns for a second London season, this time to the Barbican. 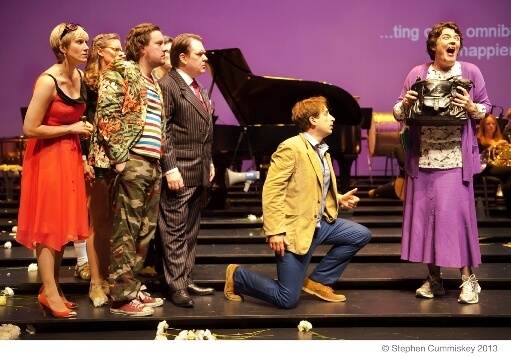 Once more unfurling to a hyperactive score, with surreal variations on Beethoven and ‘Auld Lang Syne,’ The Importance of Being Earnest is transformed into a fabulous kaleidoscope of music and manners.